Before we see the robots coming for us, it seems we’ll be able to hear them coming. Boston Dynamics, the robotics company owned by Google’s parent Alphabet, has been working with DARPA, the Pentagon’s research division, to build an autonomous robot that could carry supplies for troops. DARPA first showed off the robot—the Legged Squad Support System (LS3)—in 2012. It was designed to carry at least 400 pounds of supplies and be able to follow Marines through rugged terrain that regular vehicles wouldn’t be able to traverse, like a robotic pack mule. But the military has admitted that it probably wouldn’t see the front lines any time soon. It’s too loud. 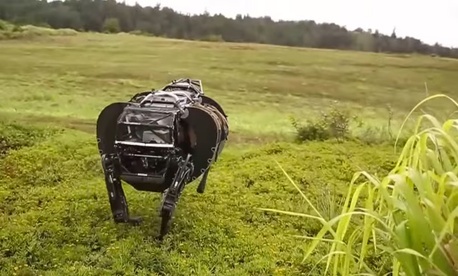 Boston Dynamics also used some of its DARPA funds to build a smaller, faster robot dog called Spot. While they’ve proven to be quite adept at pulling Santa’s sleigh , they weren’t much more useful to the military than their big brother. Spot was equipped with an electric engine, so it was a lot quieter than LS3, but its slight frame meant it could only carry about 40 pounds, which isn’t much of a help to Marines who generally carry about up to 100 pounds of gear themselves. Both robots also would’ve been difficult for Marines to easily fix in the field if something went wrong. The robo-dogs are now in storage, and without another contract from the government, it’s likely that we won’t be seeing these robots aiding the military anytime soon. The Marines, however, are also experimenting with other autonomous robot technologies, such as drones, so it’s possible that some of the technologies developed for LS3 and Spot will make it into future devices.